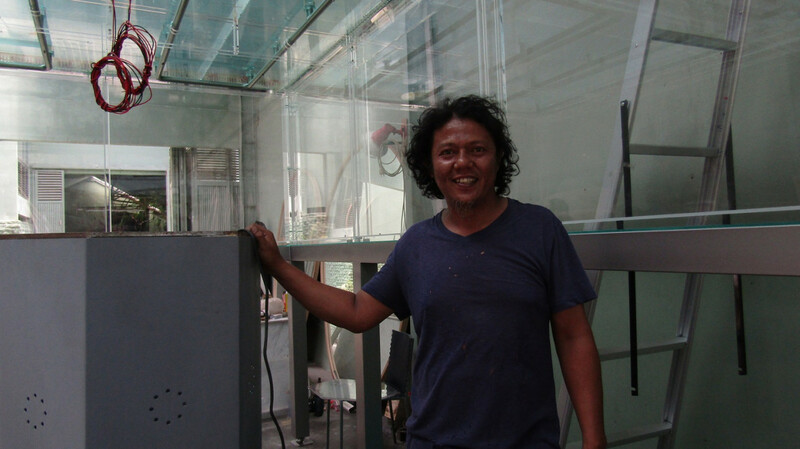 Indonesian artist Handiwirman Saputra, 44, has been invited to exhibit his works at the upcoming Venice Art Biennale (La Biennale Arte di Venezia), slated to run from May 11 to Nov. 24 in Italy. According to the biennale’s official website, the artist is one of 79 international artists invited by the event. “I will be the third Indonesian artist to participate in the Venice Biennale,” Handiwirman told The Jakarta Post in his studio in Bantul regency, Yogyakarta, on Tuesday. The first Indonesian artist to have been invited by the Venice Biennale, held since 1895, was Affandi in 1954. A book titled Seni dan Mengoleksi Seni: Kumpulan Tulisan Dr. Oei Hong Djien (Art and Collecting Art: A Compilation of Articles by Dr. Oei Hong Djien), cites that after Affandi’s invitation, another was sent to Indonesian artist Heri Dono in 2003. It took 49 years for that second invitation after Affandi’s. Handiwirman said he would exhibit five artworks at the biennale. “[The works comprise] a painting [for display] at a pavilion at the Giardini site, and four three-dimensional works [for display] at the Arsenale space,” he said. This year’s Venice Biennale, which is the 58th since its inauguration, will be titled “May You Live in Interesting Times”, said to be taken from an apocryphal ancient Chinese curse. Reflecting the title, Handiwirman will present a 3 by 4 acrylic on canvas painting titled Hari ini Esok Kemaren (Today Tomorrow Yesterday) and four three-dimensional works, namely Menahan Letakan di Bawah Sangkutan (Holding Placement Under Suspension), Tak Berakar dan Tak Berpucuk No. 8 (Without Roots and Without Buds No. 8), Tak Berakar dan Tak berpucuk No. 7 (Without Roots and Without Buds No. 7) and Pemangkasan (The Trimming). All the three-dimensional artworks are from the Tak Berakar Tak Berpucuk series made between 2010 and 2019. “[The painting] Hari ini Esok Kemaren is the sequel from the series,” said Handiwirman, who is an alumnus of the Indonesia Institute of Arts (ISI) Yogyakarta. He went on to say that Tak Berakar Tak Berpucuk offered a perspective in understanding a historical process. History sometimes has to “curve” and not move in a linear way according to someone’s plan or wish. There are other forces that may not be visible but they are impactful and cause changes in history. “[The Venice Biennale] curators saw that [perspective] in these works and apparently that is what they were looking for,” he said. The title “May You Live in Interesting Times” for this year’s Venice Biennale, according to its curator Ralph Rugoff’s note (https://www.labiennale.org/it/arte/2019/intervento-di-ralph-rugoff) is an expression falsely believed to be an ancient Chinese curse that was quoted in a speech by British statesman Sir Austen Chamberlain in the late 1930s. Chamberlain explained that “interesting” meant moving from one crisis to another, in a succession of traumas and disorders. Meanwhile, Rugoff feels that news these days announces one crisis after another, amid the digital diffusion of fake news and “alternative facts” that undermine the political debate and the trust on which it is based. “It is worth pausing, if possible, to question our points of reference,” wrote Rugoff. The biennale will therefore feature works of art that reflect the precarious aspects of the current situation, including those that challenge the founding traditions, institutions and relations of the “post-war order”. Fully aware that art does not directly stop the advances of authoritarian governments or help refugees all over the planet, the biennale aims to highlight a general approach to making art and stimulate critical thinking. In other words, “May You Live in the Interesting Times” hopes to seriously use art to investigate things that could be off-limits, exist in undercurrents or be inaccessible for various reasons. Besides exhibiting his own artworks, Handiwirman with fellow artist Syagini Ratna Wulan and curator Asmudjo Jono Irianto will also present a joint piece. “It is titled Lost Verses: Akal Tak Sekali Datang, Runding Tak Sekali Tiba (Lost Verses: Wit Doesn’t Come Once, Discourse Doesn’t Arrive Once),” Asmudjo told the Post in a WhatsApp message. Asmudjo made a cradle and Handiwirman made a smoking room. 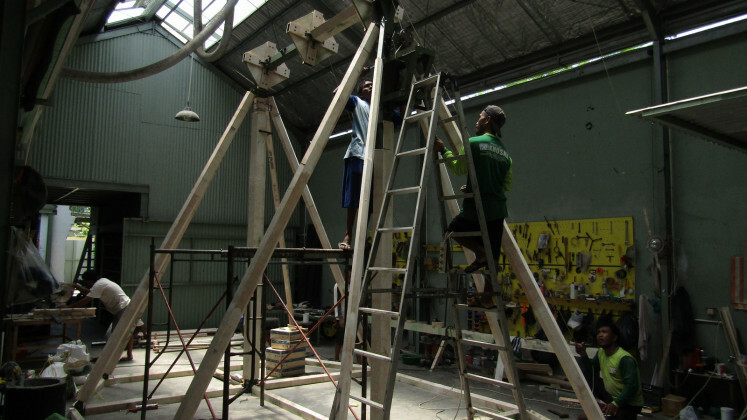 Both artworks were prepared at the latter’s studio in Bantul. Meanwhile, Bandung-based Syagini prepared a transparent locker cabinet installation artwork in her hometown. Handiwirman said the collaborative work sent a message to the world that Indonesian contemporary art was still striving in its own homeland, amid a lack of complete infrastructure. He said he believed that the development of visual art in Indonesia could not only be viewed from the western perspective.